DC Comics. Very Good. 2011. Paperback. 1401205011 Paperback PLEASE NOTE THIS IS IN GERMAN...................General wear to cover, corners and edges. Has a mark to top corner of front cover where sticker has been present. Otherwise in good condition with no noted marks to text or creasing to pages. .
New York: Vertigo / DC Comics, 2002. First Printing. Saddle-stapled wraps. Light shelfwear. Near Fine. Forty-three issues each 32-40pp., with color covers and interior. 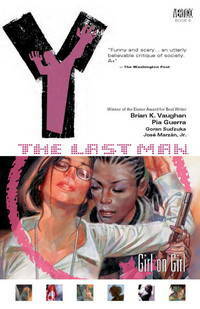 Many men dream about being the only man in a world full of women, but for struggling escape artist Yorick Brown being the last man left alive on Earth is a nightmare. Civilization is thrown into chaos when a mysterious plague simultaneously wipes out every male creature on the planet. Due to unfathomable magic, the only survivors are Yorick and his pet monkey Ampersand. Yorick soon finds himself racing across the globe to try and discover the reason he and Ampersand were unaffected by the mysterious plague. All the while, he must fight for survival against various forces desperate to use him to further their own agendas. 2009-01-09. New. Ships with Tracking Number! INTERNATIONAL WORLDWIDE Shipping available. Buy with confidence, excellent customer service! 2011-06-05. New. Ships with Tracking Number! INTERNATIONAL WORLDWIDE Shipping available. Buy with confidence, excellent customer service! 2010-07-08. New. Ships with Tracking Number! INTERNATIONAL WORLDWIDE Shipping available. Buy with confidence, excellent customer service! Vertigo. Hardcover. 1401222358 New Condition *** Right Off the Shelf | Ships within 2 Business Days ~~~ Customer Service Is Our Top Priority! - Thank you for LOOKING :-) . New. 2003-04-02. New. Ships with Tracking Number! INTERNATIONAL WORLDWIDE Shipping available. Buy with confidence, excellent customer service! 2014-09-04. New. Ships with Tracking Number! INTERNATIONAL WORLDWIDE Shipping available. Buy with confidence, excellent customer service! 2005-05-05. New. Ships with Tracking Number! INTERNATIONAL WORLDWIDE Shipping available. Buy with confidence, excellent customer service! 2006-04-07. New. Ships with Tracking Number! INTERNATIONAL WORLDWIDE Shipping available. Buy with confidence, excellent customer service! 2007-07-04. New. Ships with Tracking Number! INTERNATIONAL WORLDWIDE Shipping available. Buy with confidence, excellent customer service! 2008-07-03. New. Ships with Tracking Number! INTERNATIONAL WORLDWIDE Shipping available. Buy with confidence, excellent customer service! 2005-06-06. New. Ships with Tracking Number! INTERNATIONAL WORLDWIDE Shipping available. Buy with confidence, excellent customer service! 2009-01-09. Good. Ships with Tracking Number! INTERNATIONAL WORLDWIDE Shipping available. May not contain Access Codes or Supplements. May be ex-library. Shipping & Handling by region. Buy with confidence, excellent customer service! 2015-01-09. New. Ships with Tracking Number! INTERNATIONAL WORLDWIDE Shipping available. Buy with confidence, excellent customer service! 2006-01-02. New. Ships with Tracking Number! INTERNATIONAL WORLDWIDE Shipping available. Buy with confidence, excellent customer service! 2004-04-03. New. Ships with Tracking Number! INTERNATIONAL WORLDWIDE Shipping available. Buy with confidence, excellent customer service! 2016-07-03. New. Ships with Tracking Number! INTERNATIONAL WORLDWIDE Shipping available. Buy with confidence, excellent customer service! 2004-06-02. New. Ships with Tracking Number! INTERNATIONAL WORLDWIDE Shipping available. Buy with confidence, excellent customer service! 2003-04-05. New. Ships with Tracking Number! INTERNATIONAL WORLDWIDE Shipping available. Buy with confidence, excellent customer service! 2003-09-19. Good. Ships with Tracking Number! INTERNATIONAL WORLDWIDE Shipping available. May not contain Access Codes or Supplements. May be ex-library. Shipping & Handling by region. Buy with confidence, excellent customer service! New York: Vertigo (DC Comics), 2002. Complete run in various printings, all fine. The 60 numbers in ten volumes. Extra shipping cost.. Wrappers. Fine. Illus. by Guerra, Pia. Tall 8vo. Trade Paperback. Vertigo, 2008. Hardcover. New. 11.14 x 7.35 cm. Vertigo, 2010. Hardcover. New. 11.3 x 7.3 cm. Vertigo, 2010. Hardcover. New. 11.3 x 7.4 cm. Vertigo, 2011. Hardcover. New. 11.1 x 7.3 cm. Vertigo. Hardcover. 1401222358 Please allow 4 - 14 business days for Standard shipping, within the US. Thank you for supporting our small, family-owned business! . New. 2009-05-12. Deluxe. Vertigo. Hardcover. 1401222358 Please allow 4 - 14 business days for Standard shipping, within the US. Thank you for supporting our small, family-owned business! . Fine. 2009-05-12. Deluxe. Vertigo. Hardcover. 1401222358 Please allow 4 - 14 business days for Standard shipping, within the US. Thank you for supporting our small, family-owned business! . Fair. 2009-05-12. Deluxe. Vertigo. Hardcover. 1401225780 Please allow 4 - 14 business days for Standard shipping, within the US. Thank you for supporting our small, family-owned business! . New. 2010-04-27. Deluxe. Vertigo. Hardcover. 1401230512 Please allow 4 - 14 business days for Standard shipping, within the US. Thank you for supporting our small, family-owned business! . New. 2011-05-03. Deluxe ed..
Vertigo. Hardcover. 1401228887 Please allow 4 - 14 business days for Standard shipping, within the US. Thank you for supporting our small, family-owned business! . New. 2010-10-26. Deluxe ed..
Vertigo. Paperback. 140121813X Please allow 4 - 14 business days for Standard shipping, within the US. Thank you for supporting our small, family-owned business! . New. 2008-07-01. 2007-07-04. Good. Ships with Tracking Number! INTERNATIONAL WORLDWIDE Shipping available. May not contain Access Codes or Supplements. May be ex-library. Shipping & Handling by region. Buy with confidence, excellent customer service! Vertigo. Hardcover. 1401225780 New Condition. . New. Vertigo. PAPERBACK. 1563899809 New Condition. . New. Vertigo. PAPERBACK. 1401202322 New Condition. . New. Vertigo. PAPERBACK. 140121813X New Condition. . New. Vertigo. PAPERBACK. 1401213510 New Condition. . New. Vertigo. Hardcover. 1401219217 New Condition. . New. Vertigo. PAPERBACK. 1401200761 New Condition. . New. Vertigo. Hardcover. 1401228887 New Condition. . New. Vertigo. PAPERBACK. 1401204872 New Condition. . New.